One of my favorite all-time posts is the story we wrote about Chester Ludlow who was awarded a diploma from Rochville University in 2009. What made it so great? 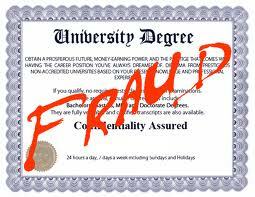 Chester Ludlow is a dog and Rochville University is a diploma mill used by those without real degrees to pull the wool over unsuspecting hiring managers’ eyes when they conduct employment background checks. Now, Chester wasn’t really looking to fool anyone. His owner thought it would be funny to expose this fake university. Unfortunately, the new diving coach at Indiana University was not so pure of heart when he applied for his position. Apparently, IU was not fooled by Drew Johansen’s “white lie” and decided to hire him anyway. Critics believe that hiring him sends a bad message to students, faculty and alumni. And I’ve learned as a background screening company, it’s best that I not share an opinion on this. But here’s one I am happy to share. I’m heartened that IU included an Education Verification in the background screening process. I’m happy that they did, in fact, discover the lie. I also think that they did a good job of considering the lie and determining in their mind whether it was a hireable offense for that particular position. Okay, I tried. I can’t hold my tongue on this. How could they have hired this guy? They are a respected academic institution responsible for shaping young minds and preparing them for the world. What lesson does this teach them? Lie on your resume and you’ll still get hired? Notre Dame got it right when they got rid of George O’Leary faster than you can say “Diploma Mill” when they found out that he lied about his education. So I might not like their ultimate decision, but I do think employers can learn a valuable lesson from IU’s employment screening process in this case.